A salad of mustardy roasted vegetables tossed with parsley and arugula with a lemony vinaigrette. It’s one of those mornings in Portland (Oregon) that is unspeakably beautiful–one of those days that makes the cold, clammy, gloomy days of June seem both irrelevant and from some distant past hardly to be remembered (even though it was a mere four or five days ago when I sat shivering in my kitchen with a wool scarf around my neck). I have two pots of beans cooking. 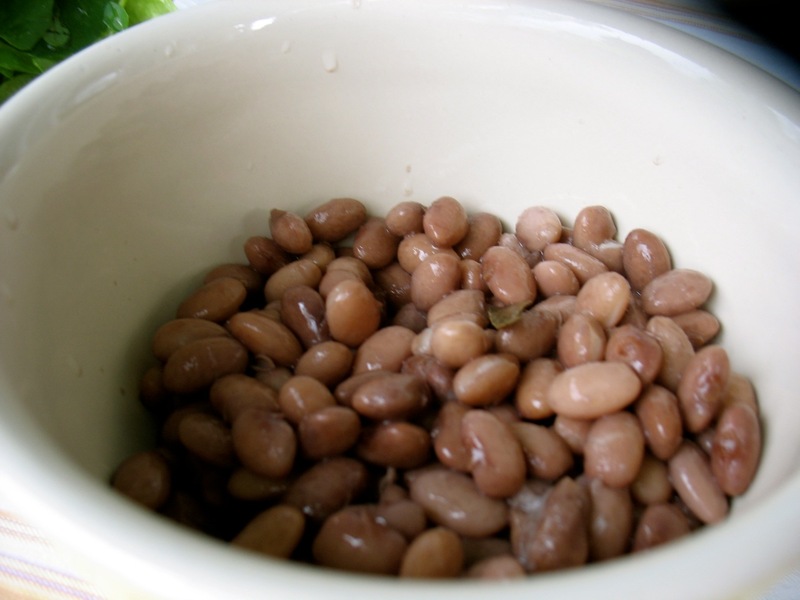 This post isn’t even about beans but as I put them on this morning I sighed a big sigh of relief. I’ve been sick for more than a week and I’ve been working too hard and the combination has once again, this spring, derailed my simple routines and pleasures. So to have sunshine and a pleasant breeze and my favorite sustenance is just too good not to note. On to salads. It’s always salad time of year for me but it’s extra good salad time of year right now. And some of my favorite bloggers seem to think so as well. I made this one yesterday for a potluck (with a toasted pumpkin and sunflower seeds instead of almonds) and I can’t wait to make this one when green beans start showing up in a few weeks and this one, which is explicitly made for the cook-with-what-you-have approach, though they all are really adaptable. The salad pictured above was a bit of a fluke. I was developing recipes for my CSA farms and was roasting vegetables (carrots, broccoli, Japanese turnips and onions) with a mix of whole grain mustard, lemon zest, garlic and olive oil. I’m also thinking about herbs even more than usual since I’m teaching an herb class in two weeks (spots available!) and have been using them abundantly. So I added lots of parsley and arugula which turned out to be a great foil for the richer, sweeter vegetables. So they got tossed together (at room temperature) with the greens and plenty of lemon juice and a little more olive oil. And I will be making this again soon! 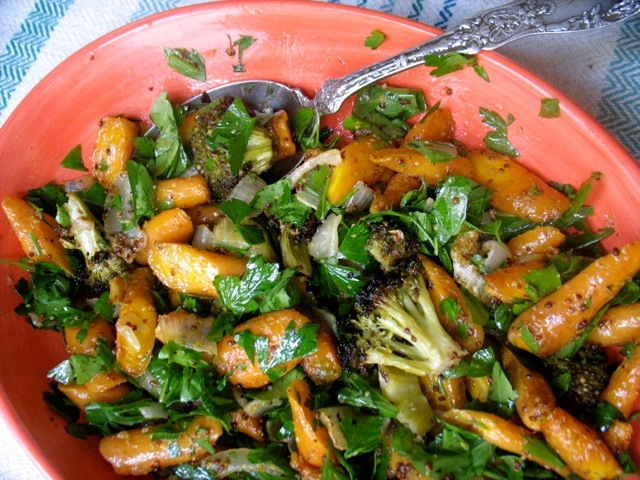 Carrots, broccoli and onions roasted with whole grain mustard, lemon zest, garlic and olive oil. Lovely as is but perfect tossed with lots of parsley and arugula and lemon juice and olive oil. This is a nice variation to plain roasted vegetables. One of my favorite things to do with these, once roasted and a bit cooled is to toss them with lots of parsley and/or arugula or just lettuce. You could add feta or ricotta salata or another cheese of choice. You could roast different vegetables (peppers, potatoes, zucchini even). 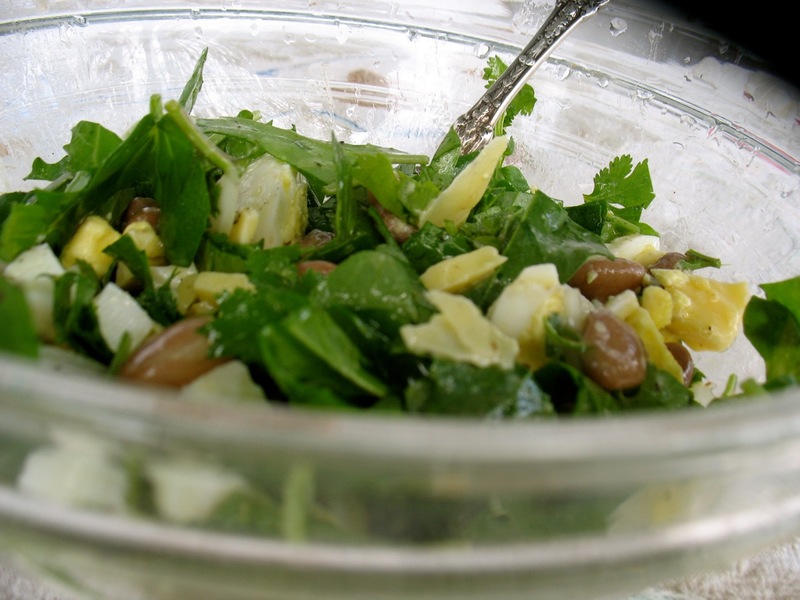 Then add a bit more lemon juice and olive oil and make a big salad out of it. Or you can toss it with quickly cooked kale and some more lemon juice. Quantities are approximations. Use however many vegetables you want in whatever ratio you want. Put all the vegetables in a big bowl. Mix the other ingredients in a small bowl and then toss the mustard mixture with the vegetables mixing very well. I use my hands to get it thoroughly mixed—messy but fun and effective. 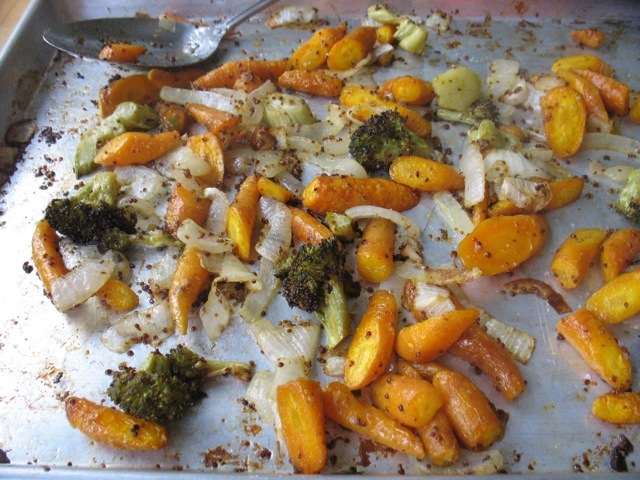 Spread the vegetables on a baking sheet with sides—try not to crowd and use two sheets if you have too much for one. Roast for 20 minutes then stir and keep roasting until all vegetables are tender and beginning to brown around the edges. As noted above, these are delicious tossed with greens or kale for an unusual salad or just eaten as is, hot or at room temp. 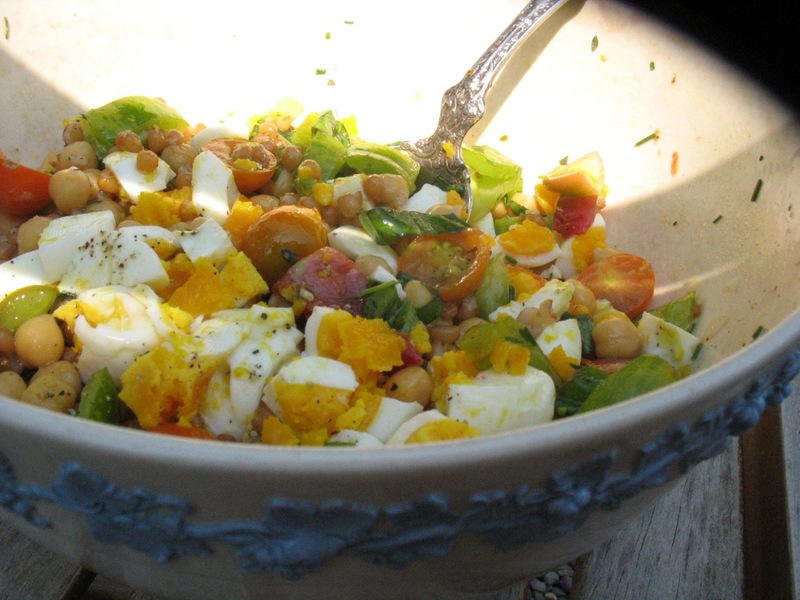 The perfect way to use up some of the hardboiled eggs you might have lying around this week. 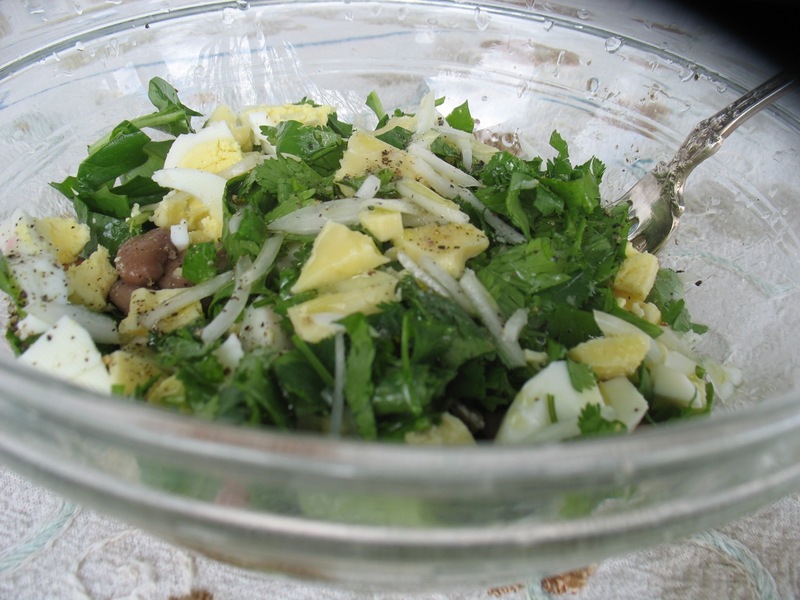 If you spend any time on this site at all you know how much I love parsley–I use it as a salad green, I mix it with lemon, garlic and olive oil for a topping to most anything, . . . And you know the same is true for Greek yogurt. 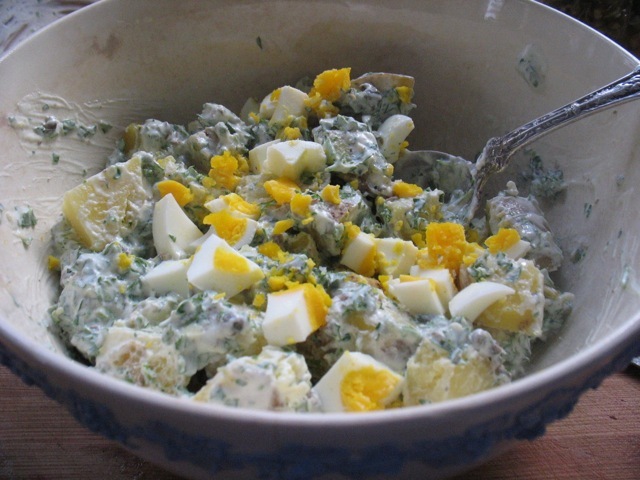 So combine the two with waxy yellow potatoes and hardboiled eggs and you get my new favorite potato salad. And if you have hard-boiled eggs a plenty thanks to the Easter Bunny, well then, put them to use here! This is going to be a very short post since I’m off to the Slow Food USA National Congress and Board Meeting in Louisville, Kentucky tomorrow. 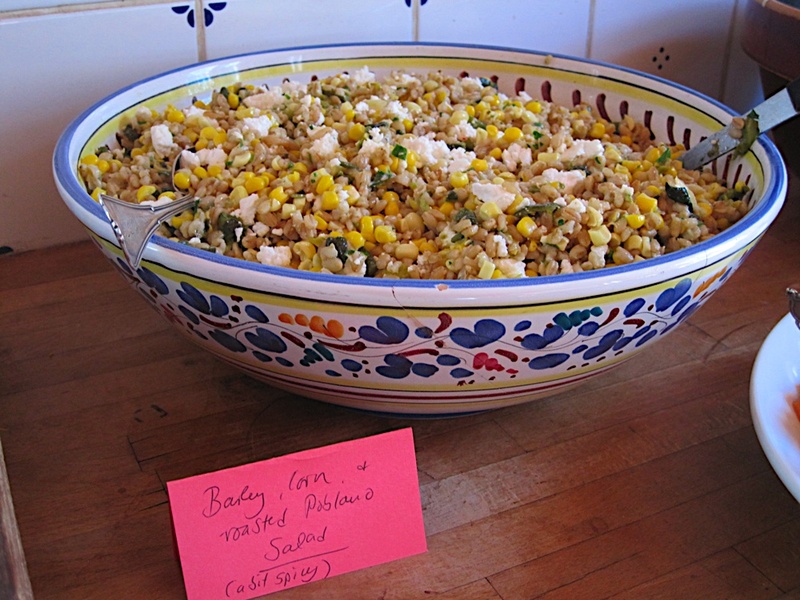 You don’t hear much about my Slow Food work here but it has been occupying a lot of my time and energy and is as about as linked to Cook With What You Have as you can get, so I figure it’s worth a mention. . .
What is Slow Food? Imagine a world where the food we eat is good for us, good for farmers and workers, and good for the planet. Slow Food USA is building that world by bringing people together through the common language of food. Through local projects, educational events and campaigns in 150 countries, Slow Food volunteers are promoting environmentally friendly food production, teaching children how to grow and prepare their food, and working to make real food accessible to all. And finally, for a look into a Cook With What You Have class check out this short profile. In a few weeks I’ll be able to post the actual cooking episodes on Food Farmer Earth this video will be introducing. The capers and lemon zest really round out this simple but hearty dish. And I am generous with the yogurt in the dressing. You want a really creamy salad so don’t skimp. 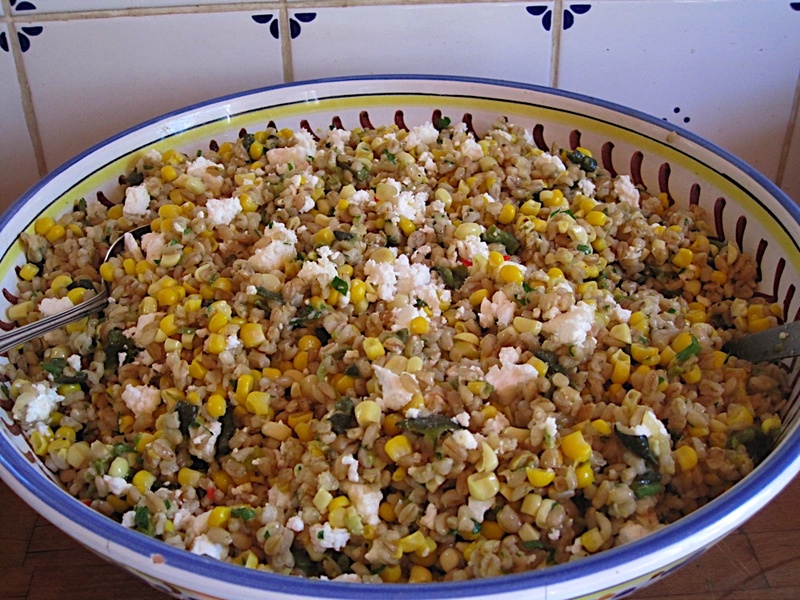 You can also use the dressing on roasted polenta or any kind of grains or beans that you’re serving at room temperature. It’s great with roasted veggies, in fish tacos . . .
Scrub the potatoes and boil them in their skins until tender. Drain and let cool. Peel if you’d like or skip this step (I usually skip it) and cut into bite-sized chunks. Mix all remaining ingredients (except the eggs) in a medium bowl. Taste the dressing to make sure it’s salt enough and has enough acidity. 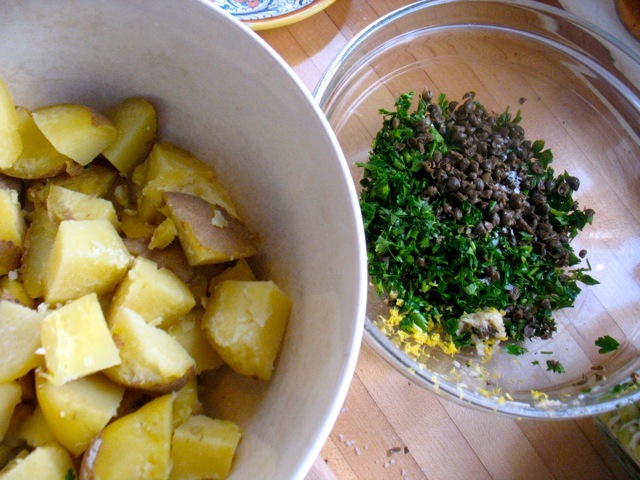 The capers add a bit of both and if you’ve mashed the garlic with some salt, go easy on the salt at first—though potatoes soak up a lot of salt. The dressing will be fairly thick. You can thin it out with a bit more olive oil or milk or cream or even a little water if you’d like. 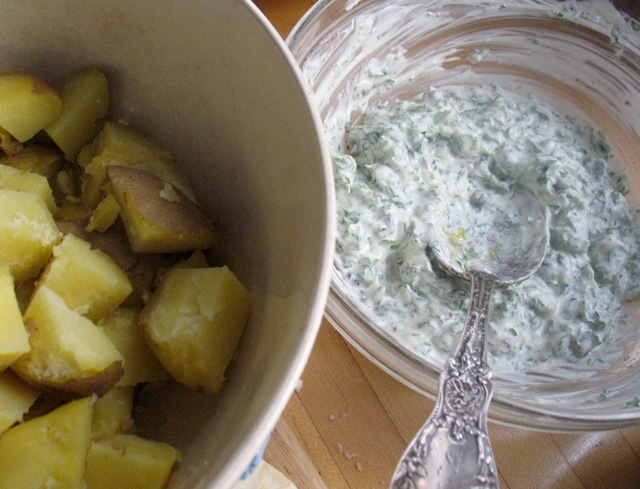 Mix the dressing carefully into the potatoes and finally add the chopped egg. If you’ve ever taken a class with me this image will be very familiar. 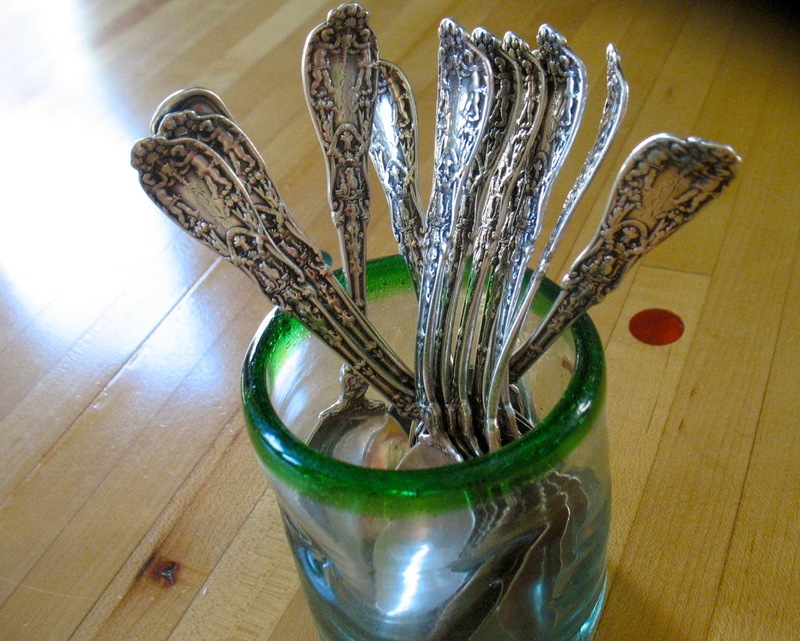 I was lucky to inherit a good number of spoons (beautiful ones to boot) and we use them many times over, all of them, in each class. Tasting as you go is one of the joys and necessities (I believe) of cooking, especially if you’re not exactly following a recipe and working with what you have. Frankly, it’s the simple spoon that probably is the vehicle for more aha! moments in class than anything else. I’ve been both cooking on the fly with just an idea and a few ingredients for inspiration and have been following recipes (closely even) as I gear up for the beginning of my fall classes. Some dishes certainly benefit from more attention to detail, ratios, and exact ingredients, like this salad which is perfection on a plate and you should make while the cucumbers last. And I’ve been doing exactly the opposite, like with this salad that I made last week in my typical, bean-loving cook-with-what-you-have approach. So I keep pondering the tools and tricks of cooking (at home) and teaching those things. Tasting is key as is having good, fresh produce. . . beyond that, salt generously, try to enjoy the process and the result and keep doing it. And if you want to do all of that with good company and no dishes to wash, come take a class this fall. And speaking of the season progressing, I’ve had lots of fun planning my classes for the summer. They are posted at CookWithWhatYouHave.com. So if you’d like new ideas for peas, favas (a simple, kind-of-life-changing method in which you don’t have to peel each bean! 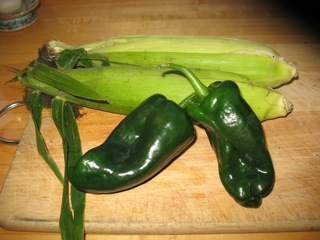 ), new potatoes, berries, peppers, eggplants, tomatoes, sweet onions, . . . come take a class. I’ve also left enough times open this summer in case you’d like to schedule a private class/party with a specific menu. Finally, I’ve recently had some requests for a pie-baking class, and gluten-free classes. Let me know if you’re interested in either! Toast sesame seeds in a dry skillet over medium heat. Keep seeds moving until they give off aroma, pop, and begin to brown. Remove and set aside. They burn easily so watch carefully. 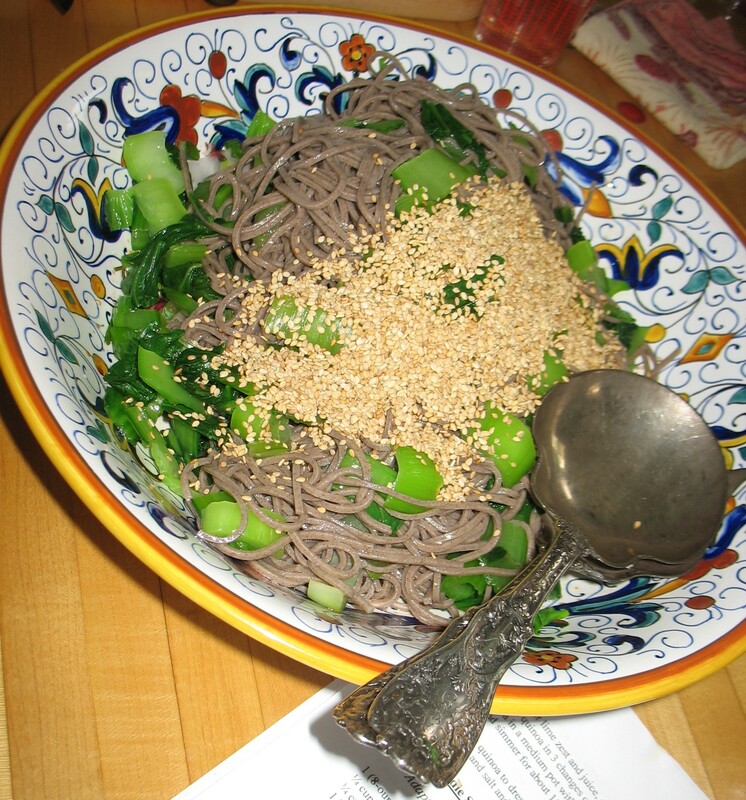 Mix dressing ingredients in large bowl, add noodles, greens, radishes and cilantro. Mix well.